FILE - One of the freed Chibok girls celebrates with family members during a church service in Abuja, Nigeria, Oct. 16, 2016. Comfort Amos is one of the 21 girls released from the grips of militant group Boko Haram last week in Nigeria, after being held hostage for nearly two and a half years. When her father, known simply as Amos, saw her after the ordeal, he couldn't believe his eyes. "Oh my daughter, you are still alive! I wasn't optimistic about the possibility of seeing you again," he told VOA Hausa Service, recounting his first words to his daughter. Amos said he had lots of questions for Comfort about her treatment, and she assured him that she was not abused or forced to marry any of her abductors. She said the girls had adequate food until recently when there were shortages. She also said, contrary to some published reports, the other abducted Chibok girls are still alive and were not harmed during bombing raids. Those selected to be released were done so practically at random. 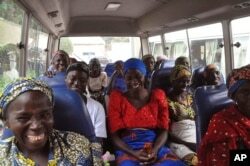 FILE - Family members of the Nigerian Chibok kidnapped girls share a moment as they depart to the Nigerian minister of women affairs in Abuja, Nigeria, Oct. 18, 2016. "They were called and asked to form a line, and after a number of them were counted, it was stopped," Amos said. "Fortunately for her, she was among those released. They were told that the total of girls to be released was 21 and that by the grace of God, the rest would be released later." Boko Haram's abduction of more than 200 girls from Chibok, an area located in the Borno state of northeast Nigeria, garnered global outrage, including a call for action by U.S. first lady Michelle Obama. The inability to rescue the girls became a campaign issue, and helped propel President Muhammadu Buhari to victory over former President Goodluck Jonathan. Yakubu Nkeki, chairman of Abducted Chibok Girls' Parents Association, told VOA that he believes the ordeal is finally taking a positive turn after so much frustration. Nkeki's daughter is still being held captive. "Even though my daughter was not among those released, I am happy seeing those children," he said. "As the chairman, even if one girl is released, I will join other parents in celebration for that would mean that God has started answering my prayers for all of them. And so I am optimistic that my daughter will be released if she is alive, as there is no reason why she would not be. The way the government pushes for their release now makes us optimistic." The government's negotiations with Boko Haram have been both secretive and controversial. After taking office in 2015, Buhari signaled a willingness to negotiate with the group if a "credible leader" could be identified. FILE - Nigerian Vice President Yemi Osinbajo and other officials meet with the 21 Chibok girls released by Boko Haram militants at the DSS Hospital in Abuja, Oct. 13, 2016. During last month's U.N. General Assembly in New York, Buhari expressed frustration over not knowing who, in fact, led the terror group and could be counted on to uphold the other end of a bargain. 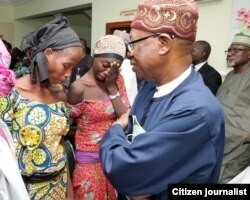 Nigeria's Information Minister Lai Mohammed said he believes the release of the 21 girls is the first step in a deal to release all of the girls, but he declined to give details of the terms of negotiations. "Already we are on phase two and we are already in discussion," Mohammed told Reuters. "But of course these are very delicate negotiations. There are some promises that we made also about the confidentiality of the entire exercise, and we intend to keep them." Alex Thurston, a scholar of Islam and politics at Georgetown University's African Studies Program, has followed the ordeal and believes negotiations with the group are appropriate if done correctly. "There have been at least two major incidents where ransoms were paid before, so there is a precedent for negotiating with Boko Haram in a very limited way," he said. "But the Nigerian government has tried in the past to open up a broader kind of dialogue and, for me, I think that those attempts — even though they said all of them ended in failure — I think it would be worth it to keep trying [that approach] to see what might happen." It is unknown whether the latest captives' release was part of a prisoner exchange, ransom payment or some other deal. Thurston acknowledges the moral ambiguity of negotiating with terror groups and the argument that it could offer an incentive for Boko Haram to make future abductions. He also believes, however, that if negotiating with the group could bring an end to the insurgency that has decimated the northeast of the country and displaced over two million people, it is worth exploring. "I think that at some point, there's going to need to be some kind of a political settlement to this conflict," Thurston said. "Maybe the diehards in Boko Haram are so far beyond whatever the Nigerian government might say that it wouldn't be possible, but I do believe there must be elements and segments of Boko Haram that might be persuaded to lay down arms under some kind of political settlement." Ibrahim Garba and Grace Abdu contributed to this report.